What a month! I’ve just returned from my third conference in five weeks, and I am so grateful to have had the opportunity to talk about the West Bloomfield High School Literary Garden in so many venues to so many people. Whether it has been fellow educators, environmentalists, Hemingway or Vonnegut scholars and fans, gardeners, librarians, students, veterans, or the general public, I am always amazed at the positive feedback, ideas, and offers of help we receive after people hear what we have going on in the garden. It's fall, so my students and I prepared the garden for the winter by cutting down the annuals, creating a compost bin, and seeding the marigolds for next year. In October, Dr. Melissa Talhelm and I presented at the NorthAmerican Association for Environmental Education in Madison, Wisconsin. This exposed our work on an international level; after our presentation, I had an educator from Mexico City approach me for my contact information as she is interested in creating a literary garden at her school. Green Teacher Magazine, based in Toronto, Ontario, would like for us to contribute an article to their publication. Dr. Talhelm warms up the early arrivals by cracking a few jokes. Dr. Morgan Hope Phillips, a leader in environmental education in the U.K., blogged about the Literary Garden after attending our session, calling it “one of the most exciting and uplifting stories I heard at the NAAEE conference." WOW. Just, WOW! We've gone INTERNATIONAL! This past weekend, I had the great pleasure of heading back to see my friends (and our Literary Garden sponsor!) at the Kurt Vonnegut Memorial Library to celebrate VonnegutFest 2016. First of all, HAPPY BIRTHDAY, KURT VONNEGUT! I attended the Veterans Reclaim Armistice Day session on Thursday night and connected with the very talented and passionate Jason Moon, an award-winning musician, community activist, and Iraq War veteran who works tirelessly to help returning veterans heal through the creative arts. His nonprofit group, Warrior Songs, works with veterans to help them navigate the many, many transitional issues they face upon their return to civilian life. His group also works with civilians to better educate them on veterans’ issues. My discussions with Jason and veteran Barry Scanlan will provide me with some important talking points as I begin teaching Slaughterhouse-Five with my students next week. I was also able to brainstorm some exciting ideas with the president of the Indiana Trails Fund, Richard Vonnegut, and I am looking forward to working with him in the very near future! I also had the pleasure of meeting the delightful Marc Leeds the week his new book, The Vonnegut Encyclopedia, came out. 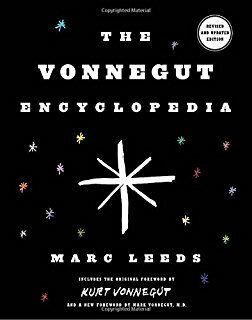 Publishers Weekly called it a “must-have,” and if you are a Vonnegut fan, you do indeed HAVE to check it out! My presentation on the Literary Garden went very well, and I was super excited to have some of my West Bloomfield students there! Josh and Rachel Downing “just happened” to be visiting their mom, Deb Lambert, this past weekend, and Deb is the Director of Collection Management at the Indianapolis Public Library, and she kindly invited some of her fellow librarian friends to attend…which meant that a) I called on Josh and Rachel like they were in class (sorry guys!) and b) Librarians ROCK! Rachel, me, Josh, and Deb - Michael is photobombing in the background! Team Vonnegut was, as always, incredibly wonderful to me. Thank you, Julia, Meredith and Andy, Max, and Chris for making sure I had everything I needed and then asking again if I needed anything else. So happy to be a member of your karass. Also, I dig the gift shop. The Center for Ray Bradbury Studies, headed by Dr. Jon Eller, is housed at Indiana University (IUPUI's School of Liberal Arts). YOU GUYS. YOU HAVE TO GET IN THE CAR AND GO TO INDY. Do you realize that you can see Kurt Vonnegut’s writing desk AND Ray Bradbury’s writing desk within miles of one another? That you can peruse Bradbury’s own LIBRARY OF BOOKS? In one hand I am holding Ray’s own first edition of Fahrenheit 451; in the other, I have one of the few surviving asbestos cover copies that still survives (number 188 out of only 200 copies printed, each numbered and signed by Ray himself). Dr. Eller explained that out of the ones that survive, many are scorched because people would bring them out at cocktail parties and try to light them on fire to prove they could not be burned. Ray’s copy is, of course, pristine. I want to thank Dr. Eller and his team for making the time to meet with me on a VERY busy day. And yes, I have my Bradbury homework assignments! I promise I will have them done by the time we meet again in July! Oh, and no big deal, but I also got to see a National Book Award this weekend. And a National Medal of the Arts. You could say I’m fired up to start the week tomorrow! I am betting my excitement is INFECTIOUS!